Notre Dame Science Club golden jubilee! 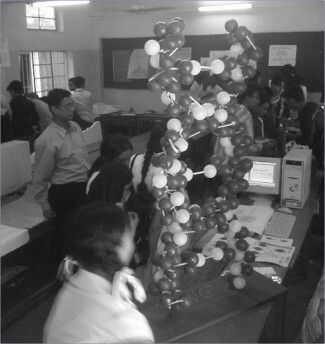 The Notre Dame Science Club celebrated its Golden Jubilee of 50 years (Notre Dame itself is rolling on 56 years) with a General Knowledge competition and Science Fair for both school and college level students, starting on 9th February till 11th February. Notre Dame's general knowledge and science competitions are very popular occurring once or even twice annually. This year the participants were low, still with a diverse 205 projects being displayed by 35 institutions. The projects were divided into the following three categories: (1) Physical which refers to Mechanics and Electricity (2) Biological well… as the name says, projects related to biology, and (3) Computer Web page designing etc. The young scientists who displayed their projects were diverse alright; traveling from Mars to Earth, covering from volcanoes to time machines, zooming into DNAs and zooming out to Global Warming effects you could almost find every genre of science being represented! One very common project was electricity generation… They had electricity being produced form wind, water, rain, hail and even sunlight and sea waves! Surely, if this bunch of people actually set up their projects, Bangladesh will have no trouble with electricity. Projects ranged from water treatment plants (where fishless aquarium type thingies were used for water flow and processing), modern sewage control system; low cost freezers and amplifiers and projectors and microscopes and a lot more low cost stuff, pollution cleaners and even circuits for mosquito chasers! The recent JMB threats and bombs explosions seemed to have aroused a lot of new ideas as quiet a few security robots (with cameras in their nose and guns in their mouth) and alarm systems were also displayed. Many projects at the same time were related to our daily life there was one project which devised a simple mechanism using which clothes could be saved from the rain very useful for the mothers and they claimed that the system could be set up using only Tk.1,500. There was also a project which devised safe emergency escape routes for the garment workers. The judgment of the projects was done on Saturday by judges from Dhaka University and an X - Notre Damn teacher. Other than the related science affairs, Notre Dame suddenly became an excellent and well rounded dating and tankifying spot. With boys and girls meeting from various schools and colleges new relationships and crushes are inevitable and also were good news for boy/girl friends especially of the participants. Nonetheless, in the General Knowledge competition 8 different institutions participated, with NDC Gold as winner, NDC Blue being the 1st runners up and Motijeel Govt. Boys High School being the 2nd runners up. One thing was evident however, with the up coming O'Level, AS and A2 Level examinations in May, very few English medium institutions had participated in fact out of English medium schools only Scholastica (school level) had participated. The results of the competition will be given out on the 3rd of March along with a major program setup 10 major scientists of Bangladesh will be recognized that day along with cultural shows, reminiscence, and reunion and even a concert where the participating bands will be Icons, Tahsan, Shironamhin, Bappa and a few more underground bands. In short, Notre Dame Science Club is having a blast celebrating its Golden Jubilee in a high standard manner. The last thing that I expected to write for this report was; it was fun! Yet here I am, actually saying it. There was arguing, and mocking and new friends and barbecue party and disco…and what not! Doesn't really sound like a debate championship does it? The efforts on part of BDC and ISD to ensure that participants enjoyed the event, however, were truly praiseworthy. Bangladesh Debate Council (BDC) organized a tournament for the selection of 5 debaters who will represent Bangladesh in the School World debate that will be held later this year in England. The International School Dhaka (ISD) hosted the two-and-half-day long event and it was indeed an experience for all participants. On the evening of 9th February, 12 teams consisting of three debaters each, from 8 institutions were present at the ISD auditorium, along with adjudicators. Teams were from Sunbeams, Sunnydale, ESS, Notre Dame college, Manarat, BIAM, Maple leaf and ISD. Debates were held in the parliamentary style, with each team given 15-20 minutes preparation time, after which each debater had to speak for 8 minutes. During the first five rounds (which took place on the 9th and then for the whole day on the 10th), teams competed against each other and then the four teams who won most rounds qualified for semis. On the evening of the second day there were the scrumptious barbecue, a small concert and finally the results of the first five rounds. Breaking teams were Manarat A, Manarat B, Notre Dame college, Mastermind C.
There was this aspect of the whole tournament that I personally liked and that was how, at the end of every round the debaters were given a score sheet to judge the adjudicators on how well they carried out the session. Finally it was the top few adjudicators who made were selected by the participants themselves to go on to the semis Well those who did not make it (mainly the participants) they weren't too upset, the food and the dancing had helped to relax and they knew that the experience was all that counted. 11th was the day of seriousness, with council meetings and the semis and finals. The semi finals were fought between Manarat A and Manarat B, and against Notre Dame College and Mastermind. After a heated round of semis, Mastermind and Manarat made it to the finals. The competition was close and intense and finally Manarat, reigning champions, kept their reputations intact and once again earned the Champion's trophy. In the prize distribution ceremony, the top ten speakers of the tournament were announced. These speakers will have to go through a stringent selection procedure, the end of which will present the five top speakers who will be representing Bangladesh in the World School Debate Championship later this year at Cardiff, England. So people just keep your fingers crossed and hope that we send off a killer team! To pay homage for our language martyrs who laid down their lives for our mother tongue, a special assembly was held in Marie Curie School on Monday, the 20th of February. The tiny tots placed bouquets at the school's own Shahid Minar and sang the immortal tune, "Amar Bhaiyer Rokthey Rangano". Students of the senior classes also recited and sang other famous songs related to the day. It was a great occasion, both sombre as well as jubilant. Playpen had its annual sports on Saturday, 25 February 2006 at Gulshan Youth Club. The main events included the boys' football match and girls' handball match. It was an inter-house competition between school teams 'Mars' and 'Jupiters'. The first match was the girls' handball that ended in 4-1 in favour of the Jupiters. In the football match both teams fought tooth and nail with no goals scored till halftime. The second half saw a renewed effort by the Jupiters who won the match by 1-0. Medals, certificates and trophies were handed out by Mrs. Sabera P. Harun, the Principal and Mrs. Shahrier Quader, the Vice Principal.